Among that group, I have kind of a unique history. Most of the others went on to be writers or artists, a couple of them became editors. But most of them went on to follow one discipline. I ended up not only getting into editorial and management, but starting a company (or three)–I had to learn everything. I was an owner, a publisher, I had to learn every creative discipline, I had to learn production, manufacturing, marketing, promotion, advertising; and I had to learn enough Management 101, math and GAAP to understand the business of the business. I took legal seminars to better understand intellectual property law. So I had kind of a unique point of view. It doesn’t mean I know everything. It just means that I know some things that few of the others had to bother with. The bottom line is that I was taught a lot by a number of old pros at DC and by Stan, with whom I worked very closely for the first few years at Marvel, on the Spider-Man syndicated strip as well as the comics. Speaking of generation gaps–after reading through a few of DC's '52' books recently, I noticed I hardly knew any of the creative guys/gals. I'm only 40, but damn, did that make me feel old. I was just thinking reading this that you should put together a book based on those seminars. I remember those books that Stan had written with John back in the 70s and 80s about drawing comic the "Marvel Way". I think any creative soul would really benefit from your insights. Reading your stories are really opening my eyes to what happened in the days I was immersed in comics. I remember all the 25th anniversary stuff going on at Marvel and the whole Kriby vs. Marvel ordeal. And of course remember the birth of your other various ventures into comicdom. I've got to say Jim you really are one of the few truly Successful people in comics, you've provided a lot or great material and opened the doors to many artists and writers. People can say what they want about you, but I have to say I've come to admire you even more so from the days of Valiant, Defiant, Broadway and even more so here in your blogs. I remember the first time I'd seen your name pop as editor in chief at Marvel and I was basically like who the hell is this guy? Now I have to say I'm glad to see your views and ideas, the great thing about it though is you're right about most things on here. I fully agree with you on the whole instant of the "special limited editions" of books and event books are really killing the industry. Some of them are great, but truthfully it's few and far between. Secret Wars, Crisis, Mutant Massacre, and the latest Green Lantern Story arch are some of the few greats. The sad thing these days is that you have a lot of these companies run by people who are business people and not creative people. They don't understand that when you try to formulate genius, creativity, and art it loses most of those and other qualities that make it great. The idea of making it into a assembly line type process to increase profits just to squirt out another unit will eventually alienate the people you're trying to attract. Creativity, genius and success don't always go hand in hand. The thing they don't understand is Comic books didn't become what they are today overnight it's taken them over 70 years to get this far. Thanks a bunch Jim!!! I remember Whilce Portacio was very upfront that Wetworks was delayed because he lost his passion for comics in general following the death of some of his immediate family. There was a Hero Illustrated interview published in Previews Vol. III No. 10 where he was asked "Do you like going to conventions?" Whilce replied "For me, comics, since they predominantly deal with the fantasy world, have always been a medium where the creators are asking the readers, 'Do you believe?' Right after the passing away of my sister, I had a hard time getting back the inspiration to create those wonderful fantasy worlds. But when I went to the Chicago Con in July of this year, I was approached by all these fans who still believed and still want to believe. I regained that inspiration to once again bring those extraordinary fantasy worlds to life." Ah, so Diana Ross' "I'm Coming Up" was really about her visit to the Marvel offices! 🙂 Seriously, I'd love to know the reason for that crossover. Anything to do with Dazzler? Lol. There were some cool things that happened around the Marvel offices. One of these days I'll get Jim to write about the time Diana Ross came by. I'd like to hear about that if it did.. There seems to be something of a generation gap at DC and Marvel today, too, for a very different reason. They simply don't mentor young writers and artists anymore. I'm sure there are folks who started off like gangbusters in the field… then some circumstance or other dictated a change in vocation. Sure seems like you had your chances and opportunities to succumb to "other" if you were so inclined. Maybe theres hope for the rest of us.. I delight in reading this blog. Never know what cool story or sidebar is going to present itself and happen next. I cant wait to hear about how the SNL cast dropped by to preview the MTU issue, or how John Lennon came by to check out one of the Marvel Superspecials, or that time playing chess with Harlan Ellison at the airport, Marie Sevrins glass eye (JK. She did THE BEST version of Hulk in the Silver/Bronze age) or some other Forrest Gumpian encounter of being in the right place at the right time providing evidence a life well lived. Never lost the passion. Never will. 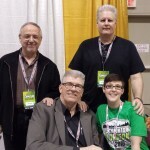 I can't thank you enough for sharing your recollections in this blog (not to mention the epic interview you gave to GraphicNYC, which I absolutely devoured). As someone who briefly worked in Marvel editorial in the '90s, I was riveted by your account of how the line editor system came to be. I always admired the work you did in the '80s, but I never knew you were so central to the transition between the Stan era and what came after. Congratulations on the Dark Horse books, I'm looking forward to checking them out. I'm so glad I decided to audit this class. Its great hanging out and picking up all these chestnuts. I am glad however that I no longer have to hassle with assignments, projects and Persnickety Professors. How lucky am I be sitting in on all this nuanced experience on Comics history, theory and application? I've toyed with the idea of doing something in the field from time to time… However I've had this underlying fear that turning a hobby I love into a livelihood would ruin it for me forever. Then not only would I be penniless, I'd deprive myself of something I enjoy soo much. From the Blog posts to date, it doesnt seem this is something that ever occured to you to worry about. After your humble start, various and assorted corporate shenanigans, power plays, office politics and and general hi-jinx with an apperent hi-jacking mixed in for good measure; you still found the time to explain to a kid what made made Spidey cool and meet with fans. All of these experiences that comprise the man called Shooter wWas there ever a time where you lost your Passion for comics? When they stoping being Labors of Love and just "product" no different from soda, shoes or underwear. And probably more important, how did you get your Passion back? Yeah, volume 1 is out now with the long awaited follow-up expected to ship on June 22nd. According to solicitations, "this titanic tome brings you the classic panels that hit the daily and Sunday papers from Jan. 29, 1979, to Jan. 11, 1981." The format for the first hardcover is pretty inexcusable. As a Canadian, I never had the opportunity to read these early Spider-Man newspaper strips when they hit the stands so I am grateful it's available. There's no question I'd enjoy the material more if it was collected properly though. The clutter filling up each page is really unnecessary. Since I'm a major Real American Hero fan, I have a ton of respect for Steve Leialoha. The foremost G.I. Joe website describes "Silent Interlude" (with breakdowns by Larry Hama and finishes by Leialoha) as "Arguably the greatest Joe story ever told." Having watched a DVD explaining the hectic events behind that story, it's even more remarkable that G.I. Joe issue 21 turned out so good. I'm proud to own both 2005's "Valor Vs. Venom" and 2008's "25th Anniversary" Hasbro comic packs reprinting this memorable issue. I didn't know the Spider-Man strip had been reprinted. If it's as bad as you say, that's too bad. kintoun, when I saw that David Lapham was also working for Dark Horse, the same potential collaboration came to my mind. Robert E. Howard's Kull has the same name as a villain from the original MIGHTY SAMSON. Did Otto Binder have the earlier character in mind? Just realized that Jim has worked on two Binder creations, the Legion and Mighty Samson. Even though it's great to see Spider-Man's syndicated strip reprinted in oversized hardcover format nowadays, I was really disappointed that the first volume was arranged so that it needs to be turned sideways. The standard horizontal rectangle format is much more convenient to read. To make matters worse, it's designed in a very distracting way with red starburts, big web patterns, and what appear to be coffee stains all over the edges. The most puzzling decision is probably that the newspaper strips are surrounded by beige borders. So John Romita Sr.'s artwork just barely qualifies as oversized after all. Online fandom reacted so negatively to the first volume in 2009 that Marvel will hopefully address these problems with the upcoming volume 2. By the way, it's nice to see David Lapham's name in that last paragraph. Considering he recently wrote Kull: The Hate Witch for Dark Horse, could a new Shooter/Lapham collaboration be possible in the future? Yuhuuuuu, I am so glad that you are writing this kind of posts and I look forward to reading the next ones! Been waiting for something like this all my life. Keep 'em coming, please. Can't wait. Just wanted to say thanks, Mr. Shooter, for beginning this series. To me your blog posts are like a great comic. They come out regularly, are packed with story, are entertaining, and form a satisfying body of work when taken as a whole. Can't wait to read more tomorrow! I first learned of this generation gap from your past interviews. Although I grew up with the comics produced by the folks at the younger end of the generation gap, I didn't enjoy them very much and never really understood why until you explained the gap and its effects. Why was I drawn to Silver Age comics produced before I was born? Because they were old? No, because they stuck to the fundamentals. This is not to say a good comic has to be a copy of a 1961 issue. Principle does not equal formula. What principles have you learned from non-comics authors: e.g., Mark Twain? You've cited his HUCKLEBERRY FINN as an example of insightful writing. Are there lessons from the business side of comics that could also apply to writing? I've rarely been so excited to "attend" a class. You're giving the "$1.98" lectures once heard only by Marvel staff … for free. What a deal! I've read and reread the excerpt JayJay posted from your seminar and can't wait to see more. You've taught me things that somehow never came up in the literature and creative writing classes I've taken. I look forward to learning more.